Tag Archives for " Kristin Hovde "
It’s guest post day here at Duct Tape Marketing and today’s guest post is from Kristin Hovde – Enjoy! Having the best, most innovative product on the market is not enough to drive traffic to your office or store. It takes a carefully-planned strategy to effectively promote your products or services. Marketing is a critical component for any business, but can be done effectively without having to shell out thousands of dollars. Small business owners may feel intimidated competing with their larger, more established competitors, but these ideas will help increase brand awareness, drive more traffic to your website, and gain new customers. Specific: Know Who, what, where, when, which, and why. Measurable: Determine how you are going to measure your progress. Attainable: Create a goal that can be achieved. Realistic: Aiming high can give you the motivation you need to reach your goals, but it can also make it much more difficult to reach. Shoot for a goal that can realistically be accomplished. Timely: Know what time frame you would like to accomplish the goal by. If you target everyone, you will be wasting valuable time, energy, and money on promoting your business to an audience that may not be in the market for what your company has to offer. Do your research to determine what age, gender, location, and any other criteria needed to discover what demographic you need to sell your products to. Networking events such as trade shows are excellent ways to get the word out about your business. It will allow you to get out of your office and meet other professionals in your industry. Instead of going to these events with the sole intention of selling your products, try to connect with these people on a personal level. The friends you make could refer customers your way down the road. Social media is everywhere we turn; from checking Facebook newsfeeds to tweeting about our day entirely from a smart phone. Billions of people are using social media, so having your business be a part of that world will help to reach out to a larger audience. Set up company accounts on Twitter and Facebook, a company page on LinkedIn, and a YouTube channel for downloading videos on useful tips that could help your customers. Is there an event coming up that supports a cause? Help support it by having your employees and yourself volunteer or by donating money or items to the cause. If there is a cause that is close to your heart, consider starting your own volunteer group. Not only will volunteering or donating put your company’s name out there in the public eye, but you will also be helping a group of people in need. Show readers how knowledgeable you are in your field by writing about it. Write blog posts that include helpful tips on a subject that your readers will find useful. This will show everyone that you are an expert in your industry. Whatever marketing message you are communicating to potential customers, make sure it is consistent throughout all of your marketing materials. Having the same text, motto, and pictures throughout your different marketing mediums will be much more memorable to potential customers. Online shopping has increased in popularity from 10 years ago, so keeping your products updated regularly is important. Not only should new products be added or outdated products be deleted, add fresh content to the products you already have listed on your website. Also, add new images and graphics to build traffic and keep visitors from getting bored. Regularly updating your website will also help your search engine rankings. Are you launching a new product? Does your company have big news? Writing a press release about it will get the attention of the media, which will end up getting the word out to your target audience very quickly. As much as this tool can help boost the awareness of your business, don’t write a press release just to write one. Make sure you have something that is news-worthy to write about in order to get readers interested. As I mentioned in tip #1, having a goal that is measurable will help you discover the success of your marketing campaign. In order to find out which campaigns have been the most successful, have employees ask customers how they heard about your business, offer coupons with promotional codes, or look into purchasing tracking software that will be able to tell you where your website visitors are coming from. Once you have gathered this information, you’ll be able to find out which tools and campaigns have been the most successful. 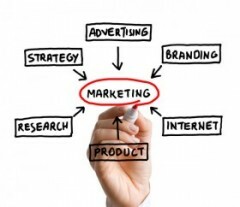 With these tips, you will be well on your way to effectively marketing your small business. Kristin Hovde is the Marketing Manager for Smash Hit Displays, an online trade show display company. She has written numerous articles related to trade shows, marketing, budgeting, and social media.